This package is the complete solution - everything you need to use Thinklabs ds32a Digital Stethoscope to capture sounds on the Apple iPod Touch, using Thinklabs Stethoscope App. Simply attach the Belkin TuneTalk to your iPod Touch and use the supplied connecting cable to connect your ds32a. iTunes Gift Cards allow you to download the Stethoscope App without having to make additional payments on iTunes App Store. 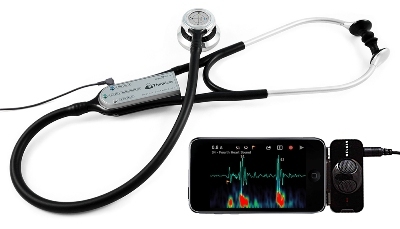 Thinklabs revolutionized electronic stethoscopes over 6 years ago and has led the performance race ever since. The ds32a Digital Stethoscope is engineered from end to end as a precision instrument by perfectionist designer Clive Smith. Now, Thinklabs leads again, with Stethoscope App for iPhone / Touch. Capture and display sounds, save patient sounds, email recordings for EMR, second opinion, or educational use. From professors at Harvard and Hopkins who have a serious attitude to auscultation, to Nurse Jackie on Showtime who just has attitude.